Please specify color during checkout as a comment. Perfect for Sub Ohm vaping. 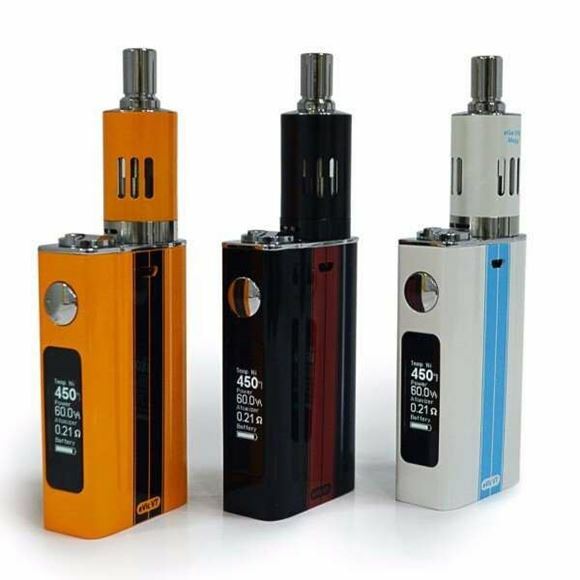 This is ready to vape full kit NOT JUST BATTERY, as it includes Joyetech eGo One Mega clearomiser. All you need is eliquid to get starter Vaping. Presenting the eVic-VT 60W, its new cutting edge technology of temperature control, embodying the concept of a healthy alternative lifestyle. eVic-VT features a super large OLED screen, supporting VT-Ti (Titanium)/ VT-Ni (Nickel)/ VW mode, and battery capacity of 5000mah.The Variable Temperature (VT) brings out a different flavor experience with the change of temperature settings, not only improving the taste,but also saving battery and liquid consumption. eVic-VT is not your typical vape, it's an evolutionary start. Joyetech enters the temperature control market with the eVic-VT. Presenting the eVic-VT 60W, its new cutting edge technology of temperature control. The eVic-VT can fire up to 60 watts perfect for people chasing that perfect taste and vapor production. The eVic-VT is a sleek looking device that is sure to stand out among the crowd with it’s eye catching and colorful design. The eGo One Mega VT atomizer has a large 4ml capacity which is vividly designed to pair up with your eVic-VT. The eGo One Mega VT has two types of heating wires: Ti (Titanium) and Ni (Nickel 200), respectively supporting VT-Ti (Titanium)/ VT-Ni (Nickel) modes. It has a metal thermal insulation drip tip designed for a comfortable and easy vape. Airflow may also be adjusted to meet your own preferences and vapor production. Joyetech again pushes the boundaries of electronic cigarettes. After modes VV (setting volts) VW (setting watts) have recently been several devices labeled VT (temperature adjustment). And Joyetech now introduces its fashion, which not only brings a number of enhancements over the competition, but it is currently the best modem temperature-controlled market. Joyetech EVIC VW-VT is a feature-packed BOX MOD, which has surpassed all expectations and their properties certainly ranks among the best of facilities. Only battery capacity and dimensions EVIC-VT VW might surprise you. Do so little boxes because they managed to get right 5000mAh battery. It is several battery life per charge. Joyetech EVIC-VT VW but excels elsewhere. It enables the use of just three different modes . The first is the classic VW, which we know from other e-cigarettes. It is designed for ordinary Kanthal spiral and is able to deliver up to 60W . Then there then we VT-Ti. This is the mode in which the set temperature and is specially designed for titanium spirals. Finally, the VT-Ni. Temperature-setting mode again, this time for Ni spirals. You yourself can see that the possibilities to EVIC-VT VW suit your needs is really a lot. The temperature can be set between 100 ° C - 315 ° C and their adjustment you will achieve a completely unsuspected administration e-liquid flavor. That's not all, by regulating temperatures also will affect consumption charge and battery life. With the new VT mode, you can reach up to twice as longer battery life and lower power once and e-liquid. No need to worry too complicated operation. Joyetech EVIC-VT VW has on its side a large OLED display , which will appear next four essential information. On the one hand you can see mode in which you are currently in, and an output power / voltage. It also shows you your resistance spirals - the addition can be locked so that you will remember its settings. And last but not least, you will also see the capacity of its battery. EVIC-VT VW will also record. So it will calculate how many times you've been dragging, and how long have you been puffing. These settings can also be reset at any time. Everything you can do with one button and rotating the ring in the upper part of the EVIC-VT VW. Would you perhaps save a bit of battery, or perhaps do not want to constantly shining on the EVIC display VW-VT? This function serves Stealth, after which the activation fails during vapování display lights. For a quick check of the set values, then you only need to press one button and the display for a short time you light up again. Part of the premium is also set Joyetech eGo One Mega clearomizér .Buy this kit so you are ready to complete the electronic cigarette. The eGo One Mega clearomizérem addition, you can use both types of glow heads, ie how the titanium swirls and those with nickel whorls. You will be able to fully exploit the potential of temperature control. It is also possible to eGo One Mega clearomizéru buy special CLR head into which you can reel in their own spirals, and even more so to adapt EVIC-VT VW your needs. Joyetech is primarily known for its quality electronic cigarettes, but also with his innovations, which make the whole industry moves forward. Joyetech EVIC-VT VW proves this assertion. Warning: For Kanthal spirals ranging 0,25Ω-1Ω maximum output power 60W. For kathalové spirals ranging 0,15Ω-0,24Ω is the maximum output power of 50W-55W. Ideal output power in VT mode, 30W-60W. VT mode only supports resistance to 1,0Ω. If the EVIC-VT use a higher resistance, it automatically switches to VW mode. When using VT glow heads always Apply a few drops of e-liquid for wool inside the head.